Sourdough was not the easiest beast I’ve taken on in my kitchen. I’ve always loved the taste of sourdough bread. My mother didn’t bake with sourdough as I was growing up, so although I loved it, I didn’t have it often. Then, when my husband and I were first married, I tried my hand at making a starter — mistakenly using store-bought yeast and only feeding every 3 days. Thankfully, I gained a bit of wisdom and persistence with age. After learning how sourdough breaks down the phytic acid in the grain, makes the bread and flour more easy to digest so we get more of the nutrients, and is a way of creating your own yeast without having to buy it at the store, I became determined to create my own starter again. I was faithful with my feedings, and after a few weeks (and several batches of delicious sourdough pancakes), I was ready to try my hand at bread! After all, sourdough bread was the real reason I’d decided to give this thing another go. I mixed all the ingredients, noted the time, and eagerly checked on my dough for signs of rising after a few hours. Hmmm, not really much going on. No. It was a pretty dense and hard loaf. Once again, I felt like a sourdough failure. Yet, I was determined to master this! I continued faithfully feeding it and making other items with my starter — pancakes, waffles, muffins, and tortillas. Wardee’s Chocolate Sourdough Cake was a smashing success! After 2 months, I decided to try bread again. This time, my dough began rising after a few hours. Whew! I learned the hard way… And now I'll pass along my bits of wisdom to you! Here's how to know when your starter is strong enough for bread-baking! Is Your Starter Is Strong Enough For Bread-Baking? First, how old is your starter? A week-old starter isn't strong enough to rise bread. If it’s at least 2 weeks old, how often are you feeding your starter? If your sourdough starter has been neglected and hasn’t had regular, twice-a-day feedings for at least three days in a row, you’ll want to get it back on a consistent feeding schedule first. Try to keep your feedings about 12 hours apart. Morning and evening work well. Furthermore, if your sourdough starter has been kept in the fridge and not at room temperature, it needs to be revitalized with at least 3 days of twice daily feedings. Next, is your starter doubling in size? Your sourdough starter should be bubbling and rising up the sides of its container within 4 hours of feeding. An easy way to gauge this is to mark the outside of the jar with a piece of tape, then feed the starter. In 3 to 4 hours, check the level of the sourdough. It should be bubbly and have risen at least a few inches above the initial mark. It also helps to use a glass jar you can see through. and it’s not rising after a few hours? Sourdough Troubleshooting Tip #1 — It warm enough? Fall and winter can be hard on starters, especially in cooler climates. Try wrapping your starter in a towel or storing in a warmer location, such as near a heating vent, on top of your refrigerator, or on an upper shelf. 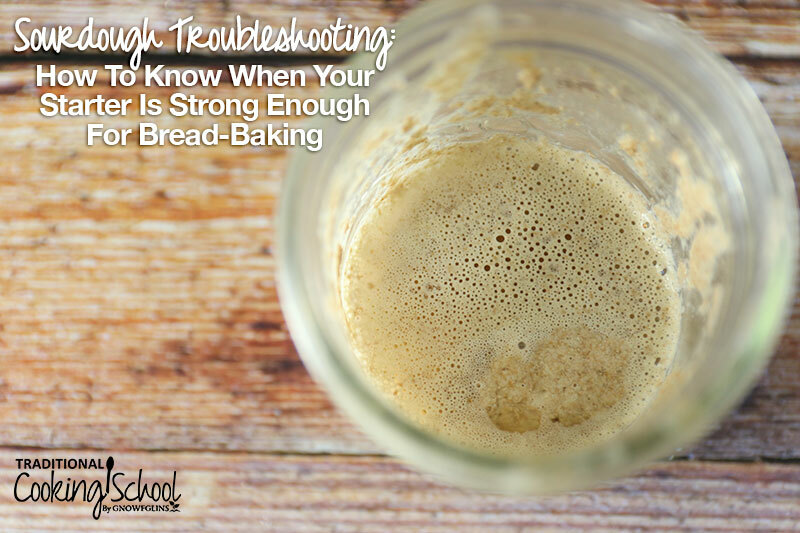 Sourdough Troubleshooting Tip #2 — Check for hooch. Is there a layer of clear or brown liquid on top of your starter? This is called hooch — and it's a sign that your starter needs more frequent feedings or more flour at each feeding. Then, congratulations! Your starter should be strong enough to rise bread! Need to start over with sourdough? Or do you want some new sourdough recipes? 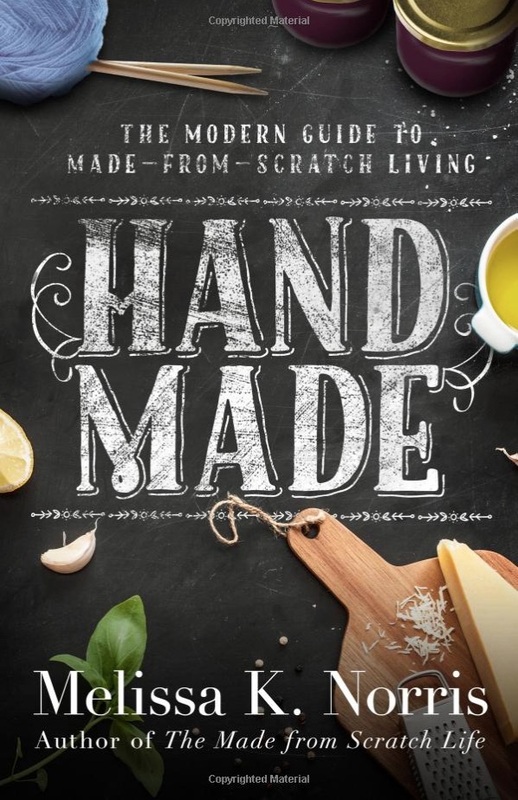 I’ve got 3 Masterclass Videos as a bonus when you purchase my brand-new book Hand Made: The Modern Guide to Made-from-Scratch Living. One is how to make a sourdough starter from scratch along with over 8 sourdough recipes including Fry Bread, Pie Crust, Tortillas, and yes, bread! 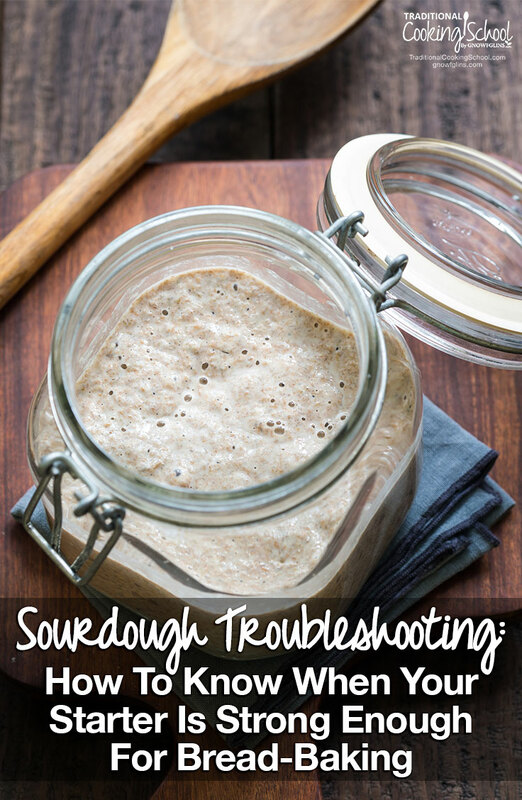 Have you been experiencing sourdough woes? Are you checking for all the signs that your starter is ready for bread-baking? Melissa inspires people's faith and pioneer roots at MelissaKNorris.com sharing all aspects of Pioneering Today. She lives with her husband, two children, seven cows, and five chickens in their own little house in the big woods of the Pacific Northwest. Through heirloom gardening, preserving the harvest, from scratch traditional cooking, and modern homesteading techniques, she shares how to implement the best of the old-fashioned pioneer skills into your modern life. For daily inspiration and tips, join her on Facebook, Pinterest, Google+, and catch her bi-monthly Pioneering Today Podcast. This is so helpful! I’ve been working with sourdough for years but have never gotten a good rise on bread that has a great crumb, too. I have never seen that a refrigerated dough needs 3+ days of feedings. I can’t wait to try this! Does sourdough cut out part of the carbs? Hi Melissa, Thanks for these tips. It inspires me to try again making bread. I wonder if it would work the same with gluten free flours. Does your book include GF alternative recipes? I’m new to sourdough. I bought a sourdough starter and at the same time I’ve started my own with water and rye flour. The bought one hasn’t shown any activity yet, but my own starter is full of bubbles and rise more than twice its initial size in only a few hours in the first day! I live in a very warm climate. I’m very excited about experimenting with sourdough! Just starting out in sourdough, wanting to get away from dependence on the grocery store for simple things like yeast etc. I am using unbleached, non-enriched whole wheat flour, unfiltered tap water. It took 2 days before I saw any action at all in my starter. Now, 6 days in, I have doubling in about 18 hours. Kitchen temperature hovers around 60°f, which explains the slow action. What I am curious about is the smell and taste. I’m not getting a sour smell. My wife even agrees, it smells like Fleischmann’s active dry yeast (there are differences brand to brand). I’ve tasted a bit of the starter, and it tastes like a regular yeast bread dough. I didn’t use any commercial yeast in my starter. Any clue as to why the lack of sour smell or taste?